By now, most people have heard of this boating accident in the bay of Santorini Island in The Agean Sea. For me it’s a little bit more personal. 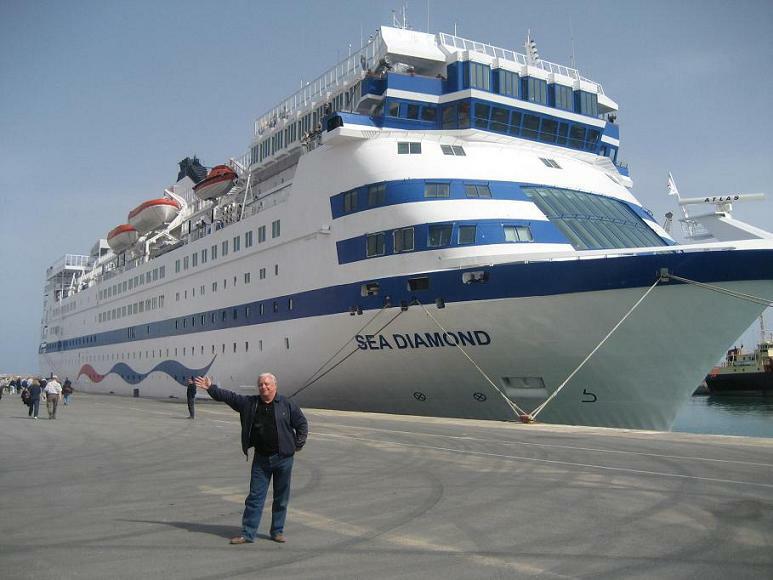 It was my good luck not to be on the Sea Diamond this week BUT I and my group were on the Sea Diamond in Santorini bay just the Friday before in the very same place. I’d guess it was the same Captain who steered into the same mooring buoy but perhaps by a few feet of difference so we didn’t have the same excitement as those on last Friday’s voyage. What bothers me is that this boat goes into Santorini every Friday so the Captain should be very familiar with the underwater dangers. The boat took on water and sunk in what is a deep, watery grave of about 400-500 feet. So much for good luck and fortunate timing. This is the AP story about the incident. ATHENS, Greece (April 5) – A cruise ship carrying nearly 1,200 passengers, most of them Americans, and some 400 crew members was being evacuated off the Greek island of Santorini on Thursday after striking rocks, authorities said. The Greek-flagged Sea Diamond apparently was listing near the island’s main port, the Merchant Marine Ministry said. Images of the vessel also were seen on island Internet Web cameras and cell-phone video footage shown on Greek television. There were no reports of any injuries, island authorities said. Some passengers were still being transferred to a small ferry, after most people on board the cruise ship were safely evacuated, Merchant Marine Minister Manolis Kefaloyiannis said. “Thankfully, everything has gone well so far. Emergency services responded very quickly and very well,” Kefaloyiannis told state-run NET television. More than a dozen ships were involved in the rescue effort, along with six navy rescue helicopters, two military transport planes and four warships. 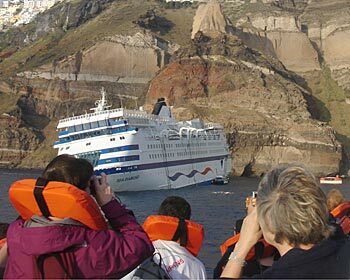 Santorini is a volcanic island, and the ship struck a reef inside the volcano’s lake-like lagoon. Thousands of tourists and residents watched the rescue effort from the island’s cliffs and port. Earlier, hundreds of people could be seen on the deck of the ship waiting to be rescued. 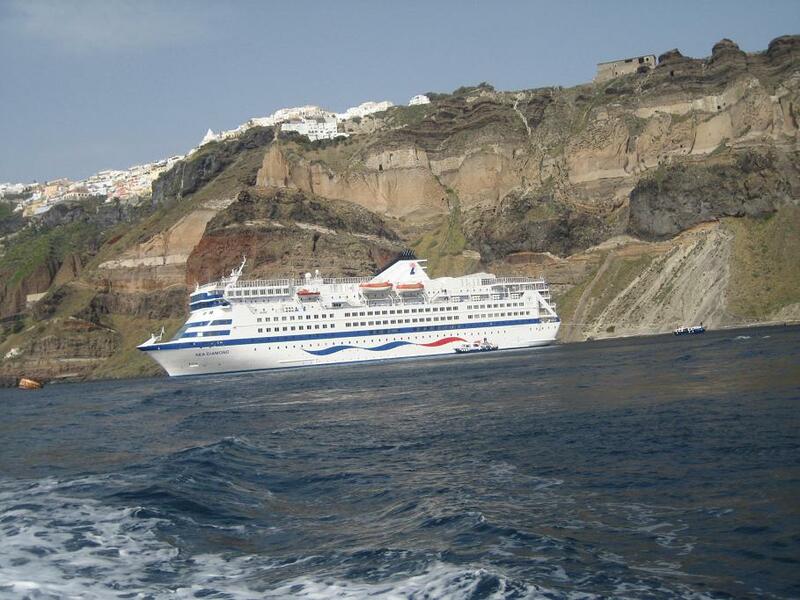 “We managed to get the ship away from the rocks and tugged the vessel toward the main harbor,” said Santorini’s regional governor, Chrysanthos Roussis. Winds in the area were moderate. The Merchant Marine Ministry said 1,195 passengers and 391 crew members were on board. The Sea Diamond is operated by Louis Cruise Lines, a Cyprus-based tourism group. “The ship struck rocks … This is not an emergency situation, but people on board are being evacuated as a precaution,” company spokesman Michalis Martheftis said, adding that no one on board was in danger. “Most of the passengers are American. The rest are from various different nations,” he said. The 469-foot vessel was built in 1986 and refurbished in 1999. This entry was posted on April 8, 2007 at 5:12 pm and is filed under luck, miracle, success, Uncategorized, victim. You can follow any responses to this entry through the RSS 2.0 feed. You can leave a response, or trackback from your own site. My daughter and I travelled on sea Diamond last year. Just the most wonderful ship and crew, but the Evacuation training was very lax. We had no idea where the life jackets were. If one was below deck in a lower , no window cabin, it could have been most confusing trying to get out. My concern is why didn’t the man and his daughter get out? There should have been plenty of time for them to get up on deck. maybe they got lost and power went out? Don’t know, but definately, not good enough proceedures in place for evacuation. Apart from that all staff and the Captian, seemed to know what they were doing and were very proficient. It seems MOST strange how they ended up against the rocks. We moored out in the bay, far away from the rocks. What a horrific loss to such a beautiful ship. I hope that the will be removed so that the cotamination can be contained. What an awful scene.